Making use of energy efficiency can help contain the cost of complying with the EPA’s Clean Power Plan and reduce electricity bills. Yet as climate policy discussions try to balance the urgent demand for quick action with upfront capital investments, the benefits of energy efficiency must be viewed in the long term. As efficiency programs are being ramped up by utilities with an over-capacity of power plants, rates may rise for a few years before they fall. Policymakers and stakeholders need to get past “rate fixation” to see the long-term value of energy efficiency. With the strong “nudge” of the Clean Power Plan, we have an opportunity to cut future electricity costs while addressing climate change. The Clean Power Plan allows states to implement their goals through “building blocks”, including energy efficiency. By placing a value on reducing the CO2 intensity of electricity, more energy efficiency measures become cost-competitive. As energy is used more efficiently, non-competitive plants can be retired, new plants can be deferred, and transmission and distribution infrastructure investments can be postponed, all of which can lower long-term costs. The payback may be delayed because of the lag between demand reductions and cost savings. During this period, the stigma associated with rising rates needs to be contained. Particular attention should be paid to ensuring that efficiency programs include low-income households as a means to defuse concerns over short-term cost increases. Our electric system was built by taking a long-term approach and the Clean Power Plan affords us a chance to capitalize on efficiency investments that can pay long-term dividends. How do we shift the policy debate about the Clean Power Plan from focusing on short-term rate increases to long-term savings? How can states ensure low-income households can participate as they integrate energy efficiency into their Clean Power Plan compliance plans? We’ve seen this discussion arise more frequently, particularly in the Southeast, where historically low rates are rising in response to a variety of factors. In the context of decision makers consideration of adopting or increasing energy efficiency and a component of utilities’ portfolios, we’ve found the following explanation of rates vs. bills helpful and so am posting here for continued discussion and feedback. Rates are one component to customers’ total costs; the amount of energy used is the other. In others words RATE x AMOUNT USED = TOTAL COST. The total cost is what shows up on a customer’s bill. Well-designed energy efficiency programs reduce customer’s end use of electricity enough to actually lower a customer’s bill, even if it does increase rates. Conversely, emphasizing low rates may encourage customers to use – and pay for – more electricity than they actually need, costing them more. In summary, policy makers and other stakeholders interested in lowering energy costs for customers should consider the overall bill impact of energy efficiency programs, not just the rate impact. Cyrus, Thanks for expanding on the difference between electricity rates and bills. You’re right that the debate about rates is particularly vocal in the Southeast where electricity prices are rising for a variety of reasons. Many utilities are considering increases in the fixed portion of bills, which would shrink the variable costs that reflect levels of consumption. This would dis-incentivize energy efficiency investments…perhaps someone else will tee up “rate designs” as a future OER topic discussion. 1. In a compliance framework, state air agencies will look hard at comparative compliance costs across the four building blocks. They will find that efficiency typically comes in lower than other compliance options on a levelized cost basis. This shifts the focus away from today’s near-term focus on avoided costs, which are often based on wholesale price projections in unregulated markets rather than specific compliance choices. Given the downward trend in avoided costs we see in many states today, CPP may reframe the comparative economics of EE in many states. 2. EE generates multiple streams of benefits. Beyond reducing average bills, it also reduces wholesale electricity and natural gas prices. These indirect price effects benefit every customer in the affected market, not just the EE program participants. EE also generates multiple Clean Air Act compliance benefits. Many states will be working to comply not only with CPP, but also mercury/toxics, NOx, and SO2 related rules. EE reduces emissions/lowers compliance costs for all pollutants; this multi-pollutant benefit is something that air agencies will note. 3. EE can improve reliability. By increasing flexibility in generation fleet dispatch, EE can temper the risks of reduced system reliability. When the system generates fewer MWH overall due to EE, generation owners can run higher-emitting plants more hours on the margin without violating compliance limits. This may allow some coal units to remain in service in some states, for use in extreme weather conditions. They would not operate many hours, but would remain available for reliability purposes. Great comments, Bill. Your note that energy efficiency can reduce wholesale electricity and natural gas prices is very important, in my opinion. It means that EE can benefit every customer in the EE programs wholesale market areas. I agree with you, with the proviso that for some utilities there may be a lag time before rate reductions occur. Others disagree with both of us. For example, the NACAA Menu of Options report on the CPP states that there is likely to be a small bill increase for those who do not participate in any program offering. This is such an important disagreement that warrants further dialogue. Jevons Paradox can be avoided by instituting an environmental fee (carbon tax). So, it’s not EE leading to higher prices, higher prices lead to EE! To avoid the issue of the poor (and middle class) being hurt by higher energy prices (and all other prices, since they depend on energy prices) the solution is to put a rising fee on the CO2 content of fossil fuels and return 100% of the money collected to every legal resident on an equal basis. Since the wealthy use much more energy than the average person and because the government uses about a third of the energy, but doesn’t get a “dividend”, almost all of the poor and middle class will earn more money through the dividend than they pay in higher energy and other product prices. Such a fee will drive EE as well as the transition to clean energy supply. A study by REMI shows that such a policy will, over 20 years, create 2.8 million jobs in the US, grow GDP by $1.4 trillion, while reducing emissions by over 50%. Dan, Good points. The rebound effect, indeed, needs to be considered. And economists, beginning with Pigou in 1920, have agreed that taxing negative externalities is the most efficient policy approach, and such taxation would also curb the rebounding of energy consumption. Depending on how the Clean Power Plan plays out, it could mimic the effect of adding a price on fossil fuels that are more carbon-intensive than a state’s regulated limit. While there may not be tax revenues generated to drive EE or other clean electricity options, these clean options will still be more competitive under the CPP than they are today. Marilyn Brown is right on point, that energy efficiency will stabilize electric rates, lower water use, significantly reduce emissions. In fact, it is always less expensive to save energy than generate energy from any source. The issue is that electric utility regulation in most states rewards electric utility for generation .. that is the way they make their profits on the gross amount of electricity they produce. But what if States reward the monopoly utilities for other criteria – de minimis water use, lowest emissions, purest electric power quality (surges, sags, transients), and most stable electric rates ? The reason electric rates rise are only partially due to generation, and also include upgrading and maintenance of transmission and distribution lines, O&M on transformers and electric meters, etc. Flat electric use which means utilities need to raise rates to meet these other expenses and make their profit. The utilities also have residential and small business ratepayers subsidize large electric users, which provide reverse incentives for large industrials and commercial to reduce electricity use. We have developed a state controlled electric rate system based on large centralized electric generation.– and this made sense in the 19th and 20th centuries — but no longer in the twenty-first century. 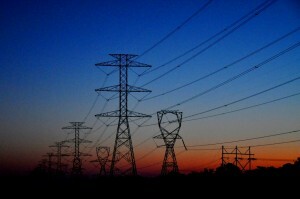 The price incentives of the old system was to encourage electric utilities to produce as much electric power as possible for a growing country .. and there were no rules on pollution, no concern on water use, no understanding or concern on energy efficiency, and no sophisticated on-site generation or electric energy storage. Well, as with all other parts of our economy, new technologies are changing the landscape as much as cellular sunk dial phones, computers sunk typewriters and carbon paper, and GPS sunk paper maps. The gnashing and gyrations to prevent change from an old anachronistic electricity system to the newer technologies options is understandable, but you can’t blame electric utilities to keep the status quo. And you can’t blame federal, state and local government programs to significantly reduce water use and harmful air and water and greenhouse gas emissions. The State regulatory systems are mismatched to the evolutionary change in technology and knowledge .. but some state governments are trying to transition to this change, and there will be some short term perturbations in electric rates, but in the long term consumers will have a far more reliable electric system. Scott, Thanks for highlighting the role of regulators. The coupling of profits (return on equity) to electricity sales provides counter-productive incentives and certainly is a hindrance to energy efficiency. Regulatory changes are occurring, as you note, but the evolution is happening at a snail’s pace (normally I would say “glacial speed,” but that’s accelerating!). I’d like to introduce a little bit of a different focus than the rest of the comments here by focusing on the equity component of Dr. Brown’s post. Working to ensure that the benefits of efficiency (or distributed resources as a whole) make their way to the entire community is something that most governments have struggled with historically. Information on the use of energy, both behaviorally and simply as a result of the buildings where the poor reside and work, is lacking in these areas. Some well known energy programs exist to help with energy bills, like LIHEAP, but programs targeting efficiency are harder to find. In that spirit, Energy Efficiency for All (http://energyefficiencyforall.org/) has launched to help bring efficiency to low-income communities through state and utility programs, and several cities have partnered to focus on efficiency in affordable multifamily housing, including Atlanta, Los Angeles, Chicago, Philadelphia, and Kansas City. These efforts are initially targeting the information barriers to efficiency like a lack of benchmark data; without information, the ability of these efforts to count towards CPP SIPs will be severely limited. But with the information in hand, programs can be designed to take advantage of the efficiency opportunities in low-income communities that may be more attractive than in other better-off areas. That kind of focus can make sure that equity considerations are kept in mind and work towards the most cost-effective achievement of the CPP goals throughout the United States, and that should be one of the goals moving forward. Matt, Thanks for highlighting the role that cities can play in delivering EE to households, and especially to those living in affordable multi-family housing. I look forward to watching the “Energy Efficiency for All Program,” especially since Atlanta, my home town and your home base, will be participating! Multifamily housing is one of the most difficult markets to transform with EE. So many challenges, including the landlord/tenant “misplaced” incentives. Good models are definitely needed, as are success stories. Thanks for mentioning Energy Efficiency for All, a project driven by 4 national partners — Energy Foundation, National Housing Trust, Natural Resources Defense Council and Elevate Energy. We are working with a bunch of effective in-state partners (we’re intent on building a sustainable knowledge base and supportive network, so partnering is key) in 12 states to drive up the energy efficiency of affordable multifamily buildings. To help with these efforts, we commissioned a bottom-up potential study for 8 of our states focused on affordable multifamily properties. Over the next 20 years we can cut electricity use in them by as much as 32 percent and natural gas use by as much as 24 percent, which should catch the attention of, and be useful to, state air regulators as they consider the building blocks in SIPs developed pursuant to the CPP. We have also assembled 12 best practices in an accompanying Program Design Guide, which should be useful for state and utility energy-efficiency program administrators. And this points to a particular challenge — and opportunity — for state and utility officials. Picking this large energy-efficiency fruit will require extending the reach and effectiveness of current programs. State air agencies will have to collaborate more with SEOs, HFAs and utilities, and NGOs can be supportive by creating cross-sector advisory groups of housing and energy-efficiency experts. We need a new context in states for tapping energy efficiency potential in affordable multifamily housing, one with greater cross-sectoral data analytics, collaboration and continuous improvement. The ROI on these investments is large, as our potential study found, especially when non-energy benefits are taken into account. And everyone benefits — communities, families as well as utilities. I look forward to all the good work ahead. Thanks for posing this question and for acknowledging the potential of efficiency programs. I would agree with Scott … the utility of the future will look very different. Jon Wellinghoff has written about this as I am sure you know. NY, Hawaii and CA are all addressing the outdated rules and structure of primarily centralized generation where the incentive is for more, not less, use. I also think that the policy Dan espouses is a very fair and good plan. My own focus has been, however on finding the funds. One way to shift the debate from rate increases to savings is to focus on variety of ways to find the monies for those building efficiency savings that will be beneficial to all. The fact is that making efficiency improvements that save energy use is actually prepaying the bill. Many of the programs that allow for payback over a longer term actually create a positive cash flow from day one. PS&G and NYSERDA have ongoing programs in which loans are repaid on the utility bill. My preference for funding efficiency and on-site renewable installation is PACE … Property Assessed Clean Energy … loans. http://www.pacenow.com The use of this vehicle was halted dramatically at the outset by the banks who feared and misunderstood the implications of the placement of a PACE loan lien on the property records. Because residential loans have remained blocked, states that had passed the legislation to allow local taxing districts to adopt PACE programs turned to using PACE loans for commercial property. CT’s program, with a green bank and state funds that leverages private banks funds has done very well. Because the state, with the help of private banks, wrote the lending parameters that are used statewide, the loans have been securitized, and because they are secured by a priority lien that remains with the house if the home is sold, the interest rate can be lower than other lending options. Texas is doing something similar with a “Pace in the Box” program that local jurisdictions can call upon for their own program parameters. Removing the residential prohibition would open up the efficiency market for residential property and allow PACE to expand more readily. Jane, You’ve outlined two of my favorite approaches to financing energy efficiency: on-bill financing and PACE. For on-bill financing, it’s important that utilities ensure “bill neutrality.” If the program performs poorly because it is not well designed or not effectively implemented, the participant should not have to suffer the consequences. Regarding PACE, you’re right that the prohibition in the residential sector needs to be lifted. Thanks for all of the tips to current programs and reports.